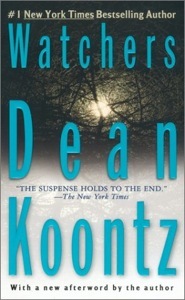 Finished reading Watchers by Dean Koontz. Watchers is about Travis Cornell who encounters a stray dog while hiking, he quickly realizes that the animal is most unusual and that something horrifying is stalking them both. The dog is the beginning of a plot involving genetic manipulation that has created two extraordinary animals. One animal is the dog, named Einstein, the other is a murderous hybrid called “The Outsider.” Travis and Einstein save Nora Devon from a stalker who is attempting to harm her. The three are force to go on the run because the government and a professional killer, who has learned the secret of the animals, are hunting them. Watchers is a interesting book that was fun to read. The end of the book was anti-climactic, I expected more from the book. Koontz transitions between the different characters point of view as the book progresses. The transitions make the plot interesting but can be hard to follow and some points.